My conclusion is that there is no reputable evidence that any of the specific physical, chemical or health claims made by manufacturers of water ionizers or their proponents have been validated by well conducted, controlled and blinded experimental studies. The few human studies on specific cures mentioned in the references were apparently not published. The main take-away point of this analysis of 'evidence' is: the entire alkaline water industry is founded on uncontrolled testimonials and a few published studies that do not even address the fundamental claims that drinking alkaline water can alter blood or cellular pH, provide antioxidant protection or provide any health benefits. There are even some studies that demonstrate negative health effects of drinking alkaline water. Claim: Alkaline water has smaller water clusters that dissolve substances better and is absorbed into the body better than tap water - increasing hydration and health. Note the many layers of improbability in this claim of smaller water clusters and health - there is no evidence that any part of this claim is true. Claim: Drinking alkaline water increases the pH of the body and that benefits health. > There is no evidence to support the claim that the alkalinity survives the acidity of the stomach, the alkalinization of the small intestine and absorption into the bloodstream or survives the normal buffering ability of the blood (and the normal ability of the body to regulate pH). There is plenty of scientific and medical knowledge to suggest that the alkaline water is simply neutralized. > There is no evidence to support the claim that artificially increasing the blood's pH would actually be beneficial to health and evidence that if these claims were true, alkaline water would actually be harmful to health. Claim: Even though the alkalinity may be neutralized by the stomach, bicarbonate is released into the bloodstream during the process - that alkalizes the blood, and that is good for health. > There is no evidence to support the claim that the relatively minute amount of bicarbonate released into the bloodstream in response to the stomach's production of HCl would have any effect on the body. There is no evidence to support the claim that any of the results of the in vitro (test tube) studies described have any bearing on human health effects, and no theories are provided to describe how the alleged in vitro effects would even be possible to reproduce in vivo (in the body). Note: High quality scientific experiments are very difficult to design and conduct in a manner that minimizes the effects of bias and wishful thinking. Conversely, it is very easy to design an ‘experiment’ that will produce results that seem to support a favored theory and will look reasonable to those who are not familiar with all the potential pitfalls that can derail even well designed and conducted experiments - i.e. the rusty nail experiment. a) three documents that contain descriptions of studies purporting to support alkaline water claims (documents labeled A, B, and C). b) links to 31 more or less relevant articles published in journals that can be referenced through the National Library of Medicine (document links labeled P). 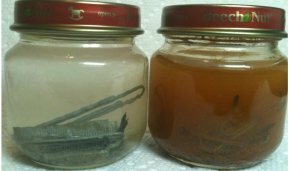 c) results of a home oxidation experiment. d) five miscellaneous documents that contained unique alkaline water claims (documents D, E, F, G and H). e) a paper that summarized of most of the claims that are made for alkaline water (document I). h) Studies that demonstrate negative health effects of alkaline water. The summary information above and details below were updated 11/24/2013. The documents and published papers I received are listed below with links to the original papers. I discuss the physical, chemical and specofoc health claims about alkaline water and the role of uncontrolled testimonials on this page. Uncontrolled testimonials do not count as supporting evidence for a theory, no matter how compelling they might be, because there are too many alternate explanations for a given observation. Thus, testimonials can never establish a cause and effect relationship between drinking alkaline water and health - yet they are commonly used because a good story can be very persuasive. Companies that sell ionizers often use testimonials to suggest that alkaline water cures or helps treat cancer, diabetes or other diseases. This bypasses FDA regulations that prevent making direct claims about curing specific diseases. I reviewed contents of the documents and published papers listed below, provided a comment on each piece of 'evidence', and provided links to their source documents. As you can see, several of the reference documents contain many of the same articles. It must be mentioned up front that it is not the job of skeptics to disprove the novel beliefs proposed to explain how alkaline water might work that fall outside limits of accepted scientific theory or to disprove various health claims. It is the sole responsibility of those who propose a new theory or make health claims to provide good supporting evidence for their claims. Evidence to support the claims must be be reproducible by anyone anywhere at any time and not be the product of experiments designed and carried out only by those who develop, manufacture or sell the product. It takes time and effort to try and reproduce experimental results not to mention assembling these pages. A skeptic may be reluctant to devote time, resources and energy to providing experimental evidence that counters a claim they know to be without any scientific credibility. Except for the potential value of convincing others of deceptive marketing practices it is a waste of time. I am pleased to say, however, that I have been responsible for convincing a number of people not to waste their money on alkaline water and similar products, and my goal is to reach as many people as possible with this message. I first saw the anti-oxidant, rusting nail experiment described below in September, 2010. I suspected at the time that the experiment did not prove anything about benefits of alkaline water, but it was not until six months later that I finally got around to conducting what amounts to a simple experiment to prove one of my suspicions. 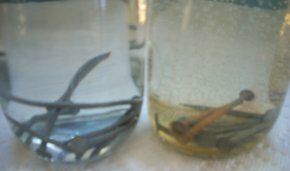 The original link to this picture is now gone, but there are others - search on: alkaline water rust nails So, what about the 'evidence' provided to support claims that "The glass container that has the Kangen water 9.5 pH water will not oxidize the nails, because it is an anti-oxidizing along with some other amazing properties. When you drink Kangen water, you are taking care of the insides and literally slowing down the effects of the aging process as well as flushing out acids and damaging free radicals."? After all, who would want to drink tap water that does this to nails, and who wouldn't want to slow down aging? I performed a little experiment with tap water to protect nails from rusting - and I did NOT use alkaline water. Click here to see my results. 1) Many of the articles and study results provided were about the disinfecting properties of so-called acid water and not relevant to the proof of alkaline water claims. Most of these I discarded but some were in the summary documents and mentioned below. 2) Several articles from reputable scientific sources have absolutely nothing to do with alkaline water. They are apparently included in the summary articles to demonstrate that proper hydration or eating a specific diet is important and to lend credibility to the rest of the 'evidence'. 3) There were references to about 31 articles (reviewed below) that were published in journals which can be referenced by PubMed. Nine papers were in vitro studies (in glass - in an artificial environment outside the living organism). The in vitro studies do not demonstrate or explain any mechanism whereby drinking alkaline water can have any effect on the whole organism (in vivo). Results from in vitro studies do not necessarily demonstrate anything useful about the effect of alkaline water in the body. As an example, one can easily show that body cells placed in distilled water (or tap water) will rupture and die, but that does not mean that drinking distilled (or tap) water will kill you.Twelve papers were not in vitro studies, but none of those appeared to be blinded and none provided any mechanism to explain how a health effect might be produced. It is important to remember that there is no evidence that the any of the characteristics of alkaline water can have an effect on the blood pH or composition let alone the environment within the body's cells. I left 6 other articles in the discussion as examples of the quality of evidence provided, although they either had nothing to do with health effects of electrolyzed, ionized water or were studies on the disinfection properties of acid water. 4) Many of the studies that are listed as proof of the health effects of alkaline water have not been published in scientific journals available through PubMed. Unfortunately, there is no law against conducting a study to support your theory and presenting it as scientific proof even though it might have been designed, conducted, &/or analyzed so poorly that the results demonstrate nothing. 5) One references lists a bunch of books that mention alkaline water. Note: a book or Internet author can say and publish just about anything as fact without providing acceptable scientific proof. One need go no further than Emoto's work on water crystals to find evidence of fiction published as fact (my analysis of Emoto's work). 6) Some of the references in the summary papers appear to be testimonials that make various astounding health claims. Evidence they have been published in peer reviewed journals is lacking. 7) As mentioned above, references D - K are included because they provide a novel twist on the available 'evidence'. My conclusion is that none of these references provides any recognized scientific proof for the health claims made for alkaline water. These are the references I was provided after weeding out duplicates and most of the irrelevant content. I left some of the irrelevant content in the discussion as an example of the stuff one has to wade through to evaluate the ionized water claims. Below the references is a listing of the more-or-less relevant evidence, links to the original documents, and my analysis. Results: ERW significantly reduced the cell death [of several kinds of neural cells] induced by H2O2pretreatment. ERW also scavenged the intracellular ROS and prevented the decrease of mitochondrial membrane potential and ATP production induced by ROS. We also examined the neuroprotective effects of molecular hydrogen and Pt NPs and showed that both molecular hydrogen and Pt NPs contributed to the neuroprotective effects of ERW. http://www.ncbi.nlm.nih.gov/pubmed/19477216 - Hepatoprotective effect of electrolyzed reduced water against carbon tetrachloride-induced liver damage in mice. (Chem Toxicol. 2009 Aug;47(8):2031-6) I don’t see anything in the abstract that indicates how the experiment was performed – i.e. when the alkaline water and carbon tetrachloride were administered – together, separately, or mixed. The study also does not appear to be blinded, and there is no CCl(4)+NaOH control group listed. There is no mention whatever of alkaline water in this paper. http://www.ncbi.nlm.nih.gov/pubmed/9169001 - Electrolyzed-reduced water scavenges active oxygen species and protects DNA from oxidative damage (pages 37 - 42) "Active oxygen species or free radicals are considered to cause extensive oxidative damage to biological macromolecules, which brings about a variety of diseases as well as aging. The ideal scavenger for active oxygen should be 'active hydrogen'. 'Active hydrogen' can be produced in reduced water near the cathode during electrolysis of water. Reduced water exhibits high pH, low dissolved oxygen (DO), extremely high dissolved molecular hydrogen (DH), and extremely negative redox potential (RP) values. Strongly electrolyzed-reduced water, as well as ascorbic acid, (+)-catechin and tannic acid, completely scavenged O.-2 produced by the hypoxanthinexanthine oxidase (HX-XOD) system in sodium phosphate buffer (pH 7.0)." http://www.ncbi.nlm.nih.gov/pubmed/17268057 - Preservative Effect of Electrolyzed Reduced Water on Pancreatic B-Cell Mass in Diabetic db/db Mice (pages 43 - 45) "ERW with ROS scavenging ability reduced the blood glucose concentration, increased blood insulin level, improved glucose tolerance and preserved beta-cell mass in db/db mice. The present data suggest that ERW may protects beta-cell damage and would be useful for antidiabetic agent." http://www.ncbi.nlm.nih.gov/pubmed/16945392 - Anti-diabetic effects of electrolyzed reduced water in streptozotocin-induced and genetic diabetic mice. "ERW, provided as a drinking water, significantly reduced the blood glucose concentration and improved glucose tolerance in both animal models. However, ERW fail to affect blood insulin levels in STZ-diabetic mice whereas blood insulin level was markedly increased in genetically diabetic db/db mice. This improved blood glucose control could result from enhanced insulin sensitivity, as well as increased insulin release. The present data suggest that ERW may function as an orally effective anti-diabetic agent and merit further studies on its precise mechanism." http://www.ncbi.nlm.nih.gov/pubmed/11044205 - Citrate therapy for polycystic kidney disease in rats. (pages 46-56) "Data in the present study strongly suggest that the beneficial effect of treatment with KCitr is a consequence of the citrate ion and its oxidation in the body to bicarbonate (alkalinizing effect). Whether an alkalinizing diet in conjunction with judicious citrate therapy will slow the progression of renal disease in patients with PKD is a question that deserves to be studied." This is an interesting paper. The study was conducted by George A. Tanner and Judith A. Tanner and originally published in Kidney International, Vol. 58 (2000), pp. 1859–1869. Since the paper actually had nothing to do with alkaline water, I was curious why the "Kangen Water Proof Book" reproduced the paper in its entirety and highlighted sections that allegedly supported the benefits of alkaline water. I wrote to Dr. Tanner to ask him if he had authorized the use of his paper to support alkaline water claims. He replied with the following comments (reproduced with permission). Thank you for the information. I was not aware that Kangen representatives were citing my Kidney International paper to support claims for a beneficial effect of electrolyzed, alkaline water. A simple calculation shows that if the pH of water is increased even to an alkaline pH of 10.5, the amount of base (OH-) present is, physiologically speaking, inconsequential. A pH of 10.5 corresponds to an OH- concentration of 10-3.5 moles/liter or 0.3 mEq/liter. The typical acid burden on an average American diet (meat + vegetables) for an adult is about 70 mEq/day. Thus, drinking a liter of electrolyzed, alkalinized water would buffer less than 0.5% of the acid formed by metabolism of foodstuffs and would have an undetectable effect on acid-base status. Based on my studies in rats, studies of others in experimental animal models, and recent controlled clinical trials (de Brito-Ashurst et al. J Am Soc Nephrol 2009;20:2075–2084 and Phisitkul et al. Kidney Int 2010;77:617–623), there does indeed appear to be a beneficial effect of alkalinizing salts (e.g. sodium or potassium citrate or bicarbonate) in animals and people with various forms of chronic renal disease. The alkali doses administered in these studies are very much larger than can be obtained from electrolyzed water and do have an impact on acid-base balance. Although I have not researched the topic (as you have done), I am very skeptical of any claims for a beneficial health effect of electrolyzed, alkaline water. My Kidney International study does not support the health claims of the proponents of this treatment. There is a lot of overlap with various pieces of 'evidence' from the different sources, and it is difficult to discuss them all without getting tangled up: The list below deals with pages 57 - 116 of the "Kangen Water Proof Book" (articles on pages 2-56 are discussed above). Pages 57 - 76 deal with the sanitizing effect of the 'acid' water and have nothing to do with health effects of drinking alkaline water. Pages 77 - 100 (links below) point to the same articles in other reference documents that are discussed elsewhere in this review. Page 77, Page 78, Page 78 - Topics discussed elsewhere. Page 79 - All about foods, nothing about alkaline water. Page 80, Page 80 - Topics discussed elsewhere. Pages 81 - 82: Apparent testimonials about alkaline water and toxin neutralization, eczema, allergies, and digestive problems. Page 83: Diabetes topic - one unpublished study, one published study, and one testimonial. Effect of alkaline ionized water on the formation and maintenance of osseous tissue (pages 88 - 90) Apparently an unpublished, unblinded study in which mice were fed different amounts of calcium with and without alkaline water. Page 92 List of studies similar to discussions elsewhere. Page 93 (duplicate of p77)icate of p77), Page 94 (duplicate of p78), Page 95 (duplicate of p78), Pages 96 - 99 deal with sanitizing effects of the acid water - not relevant to the discussion of alkaline water. Page 99 Discussed elsewhere, Page 100 Discussed elsewhere, Page 100 Acid water and plant-related studies. Pages 100 - 107 cover exactly the same material that's on pages 80 - 85 discussed/linked above. Page 108 covers material discussed here. Pages 109 - 116 duplicate the content of pages 85 - 90. We have found that long-term ingestion of alkaline ionized water (AIW) reduces cecal fermentation in rats that were given highly fermentable commercial diet (MF: Oriental Yeast Co., Ltd.). In this experiment, rats were fed MF and test water (tap water, AIW with pH at 9 and 10) for about 3 months. American College of Sports Medicine position stand. "Too many fats in the diets, which lead to the deposition of cholesterol on the blood vessels, which in turn constrict the blood flow, cause most illnesses such as high blood pressure. In accordance with the theory of Professor Gato of Kyushu University on Vitamin K (because vitamin K enables the blood calcium to increase) , or the consumption of more antioxidant water, the effectiveness of the increase in the calcium in high blood pressure is most significant. The consumption of alkaline antioxidant water for a period of 2 to 3 months, I have observed the blood pressure slowly drop, due to the water's solvent ability, which dissolves the cholesterol in the blood vessels." "Mr. Yamada, the head of Police Research Institute, suffered from severe allergy. He was treated repeatedly by skin specialist, but with no success. Then he started consuming antioxidant water. The allergy responded very well and was soon completely cured. No relapse had occurred, although he had taken all kinds of food. He was most grateful and excited about this treatment. I discovered that most allergies are due to acidification of body condition and is also related to consuming too much meat and sugar. In every allergy case, the patient's antioxidant minerals are excessively low which in turn lower the body resistance significantly. The body becomes overly sensitive and develops allergy easily. To stabilize the sensitivity, calcium solution is injected into the vein. Therefore, it is clear that the antioxidant water has ionic calcium, which can help alleviate allergy. The ionic calcium not only enhances the heart, urination, and neutralization of toxins but controls acidity. It also enhances the digestive system and liver function. This will promote natural healing power and hence increase its resistance to allergy. In some special cases of illness, which do not respond to drugs, it is found, it is found to respond well to antioxidant water. "ot only enhances the heart, urination, and neutralization of toxins but controls acidity. It also enhances the digestive system and liver function. This will promote natural healing power and hence increase its resistance to allergy. In some special cases of illness, which do not respond to drugs, it is found, it is found to respond well to antioxidant water." The important role of antioxidant water in our stomach is to neutralize the secretion and strengthen it s functions. Usually, after consuming the antioxidant water for 1 to 3 minutes, the gastric juice increase to 1½ times. For those suffering from hypochlorhydria or achlorhydria (low in gastric juice ) the presence of antioxidant water will stimulate the stomach cells to secrete more gastric juice. This in turn enhances digestion and absorption of minerals. However, on the other hand, those with hyperchlorhydria ( high in gastric juice ), the antioxidant water neutralizes the excessive gastric juice. Hence, it does not create any adverse reaction. According to the medical lecturer from Maeba University, the pH of the gastric secretion will still remain normal when antioxidant water is consumed. This proves that the ability of the antioxidant water is able to neutralize as well as to stimulate the secretion." "I found that the women with pre-eclamptic toxemia who consumed antioxidant water tend to deliver healthier babies with stronger muscles. A survey report carried out on babies in this group showed intelligence above average." "In my opinion, the wonder of antioxidant water is the ability neutralizes toxins, but it is not a medicine. The difference is that the medicine can only apply to each and individual case, whereas the antioxidant water can be consumed generally and its neutralizing power is something which is very much unexpected. Now, in brief, let me introduce to you a heart disease case and how it was cured. Last year, in August, his relatives were in despair and expected he would not live much longer. It so happened at that time that the victim's relative came across antioxidant water processor. His illness responded well and he is now on the road to recovery." "Eczema is used to describe several varieties of skin conditions, which have a number of common features. The exact cause or causes of eczema are not fully understood. I many cases, eczema can be attributed by external irritants. Let me introduce a patient who recovered from skin disease after consuming the antioxidant water. It has long been established that reactive oxygen species (ROS) cause many types of damage to biomolecules and cellular structures that, in turn result in the development of a variety of pathologic states such as diabetes, cancer and aging. Reduced water is defined as antioxidative water produced by reduction of water. Electrolyzed reduced water (ERW) has been demonstrated to be hydrogen-rich water and can scavenge ROS in vitro (Shirahata et al., 1997). The reduction of proton in water to active hydrogen (atomic hydrogen, hydrogen radical) that can scavenge ROS is very easily caused by a weak current, compared to oxidation of hydroxyl ion to oxygen molecule. Activation of water by magnetic field, collision, minerals etc. will also produce reduced water containing active hydrogen and/or hydrogen molecule. Several natural waters such as Hita Tenryosui water drawn from deep underground in Hita city in Japan, Nordenau water in Germany and Tlacote water in Mexico are known to alleviate various diseases. Extracts from " Presentation At The Eight Annual International Symposium On man And His Environment in Health And Disease" on February 24th 1990, at The Grand Kempinski Hotel, Dalls, Texas, USA by Dr. H. Hayashi, M.D. and Dr. M Kawamura, M.D. Since the introduction of alkaline ionic water in our clinic in 1985, we have had the following interesting clinical experiences in the use of this type of water. By the use of alkaline ionic water for drinking and the preparation of meals for our in-patients, we have noticed : • Declines in blood sugar levels in diabetic patients. - Improvements in gastroduodenal ulcer and prevention of their recurrences. - Improvements in hypertension and hypotension. - Improvements in allergic disorders such as asthma, urticaria, rhinites and atopic dermatitis. - Improvements in persistent diarrhoea which occurred after gastrectomy. - Quicker improvements in post operative bower paralysis. - Improvements in serum bilirubin levels in new born babies. - Decrease in complaints of constipation - a decrease in the production of putrefied or pathogenic metabolites.hma, urtBeing confirming clinical improvements, we have always observed changes of stools of the patients, with the colour of their feaces changing from black-brown colour to a brigher yellowbrown one, and the odour of their feaces becoming almost negligible. The effect of alkaline ionized water on abdominal complaints was evaluated by placebo controlled double blind tests. Placebo controlled double blind tests were conducted using alkaline ionized water and clean water at multiple facilities. An alkaline ionized water electrolyzer sold commercially was installed with a pump driven calcium dispenser in each of the subject homes. Tested alkaline ionized water had pH at 9.5 and calcium concentration at 30ppm. ...Overall scores of improvement using alkaline ionized water marked higher than those of placebo controlled group, and its effect proved to be significantly higher especially in slight symptoms of chronic diarrhea and abdominal complaints in cases of general malaise. Alkaline ionized water group did not get interrupted in the course of the test, nor did it show serious side effects, nor abnormal test data. It was confirmed that alkaline ionized water is safer and more effective than placebos.proved to be significantly higher especially in slight symptoms of chronic diarrhea and abdominal complaints in cases of general malaise. Alkaline ionized water group did not get interrupted in the course of the test, nor did it show serious side effects, nor abnormal test data. It was confirmed that alkaline ionized water is safer and more effective than placebos. When I was serving in the Fire Insurance Association, I used to examine many diabetic patients. Besides treating them with drugs, I provided them with antioxidant water. After drinking antioxidant water for one month, 15 diabetic patients were selected and sent to Tokyo University for further test and observations. Initially, the more serious patients were a bit apprehensive about the treatment. When the antioxidant water was consumed for some time, the sugar in the blood and urine ranged from a ratio of 300 mg/l to 2 mg / dc. There was a time where the patient had undergone 5 to 6 blood tests a day and detected to be within normal range. Results also showed that even 1 ½ hour after meals, the blood sugar and urine ratio was 100 mg/dc: 0 mg/dc . The sugar in the urine has completely disappeared.me time, the sugar in the blood and urine ranged from a ratio of 300 mg/l to 2 mg / dc. There was a time where the patient had undergone 5 to 6 blood tests a day and detected to be within normal range. Results also showed that even 1 ½ hour after meals, the blood sugar and urine ratio was 100 mg/dc: 0 mg/dc . The sugar in the urine has completely disappeared. It is suggested that AIW supplementation may inhibit the increase of blood glucose and lipid peroxide levels in diabetes mellitus. Fujino Y, Inoue Y, Onodera M, Yaegashi Y, Sato N, Endo S, Omori H, Suzuki K. [Article in Japanese] Department of Critical Care Medicine, Wate Medical University. We studied 13 emergency cases of liver abscess. ...Irrigation of abscesses with strong acidic electrolyzed water revealed a significant decrease in treatment duration. Evaluation of hypochlorous acid washes in the treatment of chronic venous leg ulcers. Hypochlorous acid is a highly microbial agent active against bacteria, viruses and fungi. This study aimed to determine if it has a role as an additional treatment for chronic venous leg ulcers that have not healed with standard treatment. Moscow State University, 119992 Moscow, Russia. 96-99% of the "friendly" or residential microflora of intestinal tract of humans consists of strict anaerobes and only 1-4% of aerobes. Many diseases of the intestine are due to a disturbance in the balance of the microorganisms inhabiting the gut. The treatment of such diseases involves the restoration of the quantity and/or balance of residential microflora in the intestinal tract. It is known that aerobes and anaerobes grow at different oxidation-reduction potentials (ORP). The former require positive E(h) values up to +400 mV. Anaerobes do not grow unless the E(h) value is negative between -300 and -400 mV. Electrolyzed reducing water with E(h) values between 0 and -300 mV produced in electrolysis devices possesses this property. Drinking such water favors the growth of residential microflora in the gut. A sufficient array of data confirms this idea. However, most researchers explain the mechanism of its action by an antioxidant properties destined to detox the oxidants in the gut and other host tissues. Evidence is presented in favor of the hypothesis that the primary target for electrolyzed reducing water is the residential microflora in the gut. Efficacy of electrolyzed water in inactivating Salmonella enteritidis and Listeria monocytogenes on shell eggs. Science Direct-Application of electrolyzed oxidizing water to reduce Listeria monocytogenes on ready-to-eat meats. Efficacy of electrolyzed oxidizing water for the microbial safety and quality of eggs. Poultry Science 2004 Dec;83(12):2071-8. Bialka KL, Demirci A, Knabel SJ, Patterson PH, Puri VM. Department of Agricultural & Biological Engineering, The Pennsylvania State University, University Park, Pennsylvania 16802, USA. These results indicate that EO water has the potential to be used as a sanitizing agent for the egg washing process. Susceptibility of Penicillium expansum spores to sodium hypochlorite, electrolyzed oxidizing water, and chlorine dioxide solutions modified with nonionic surfactants. Journal of Food Protection. 2006 Aug;69(8):1944-8. Okull DO, Demirci A, Rosenberger D, LaBorde LF. The disinfection of the surgery department of a garrison hospital using a neutral anolyte. Methods and resources of sterilization and disinfection in medicine. Abstracts (28 September - 2 October 1992). Russian Conference. Sensual for Life: The Natural Way to Maintain Sexual Vitality, by George L. Redmon. 2003 - 224 pgs. Natural Choices for Fibromyalgia: Discover Your Personal Method for Pain Relief, by N. D. Oelke, Jane Oelke. 2001 - 146 pgs. Light Through Food: A Reference Guide to Thriving in the Energy of the Fourth Dimension, byDonna Boynton (Channeler), Donna Boynton, Angela McLean. 2005. 100 pgs. Qi Energy for Health and Healing: A Comprehensive Guide to Accessing Your Healing Energy, by Mallory Fromm. 2003 - 219 pgs. Romo: My Life on the Edge, by Bill Romanowski, Published by William Morrow. ISBN: 006075866X. 2005. A Complete Guide To Chi-Gung, By Daniel Reid. ISBN: 1570625433 Publisher: Shambhala. 2000 - 326 pgs. Secrets of an Alkaline Body. The New Science of Colloidal Biology, by Annie Padden Jubb and David Jubb. 2004 - 275 pgs. Timeless Secrets of Health and Rejuvenation, By Andreas Moritz. 2005 - pg. 496. Reverse Aging, by Sang Whang. ISBN: 0966236327, 2001. Fantastic Voyage: Live Long Enough to Live, by Ray Kurzweil, Terry Grossman, 464 pages. Note: the page never actually claims that alkaline water has any effect on treating cancer - links are simply provided to research that allegedly shows some effect of alkaline water on cancer cells grown in a petri dish. Mineral Alkaline Reduced Water (ARW) strengthened immune system. Mineral Alkaline Reduced Water suppressed the growth of cancer cells transplanted into mice, demonstrating its anti-cancer effects. That's the only information provided about this apparently unpublished, unreviewed 'research'. Without some experimental details the claims are meaningless. 3) Suppression of Invasion of Cancer Cells and Angiogenesis by Electrolyzed Reduced Water. ERW scavenged hydrogen peroxide both in cells and medium. The RT-PCR and zymographic analysis revealed that ERW suppressed the expression and activation of matrix metalloproteinase-2 (MMP-2). ERW was estimated to inhibit invasion by suppressing the phosphorylation of p38 MAP kinase. ERW also suppressed the expression and secretion of VEGF in HT1080 cells by suppressing the phosphorylation of ERK MAP kinase. ERW suppressed the HT1080 cells-induced angiogenesis by human blood endothelial cells, suggesting that ERW may be useful for prevention and treatment of cancer. As mentioned elsewhere, in vitro alkaline water research is meaningless because there is no mechanism proposed to explain how the behavior of cells (cancerous or otherwise) in an artificial, external alkaline environment can be duplicated in the body. Alkaline water that someone drinks NEVER reaches the cells as alkaline water. Also, this was research presented at a meeting and not in a peer reviewed journal. A link to abstracts of the papers presented at the meeting. Abstract: Electrolytic reduced water free of hypochlorous acid and chlorine gas is provided which is effective for cancer treatment. Water including NaOH is subjected to electrolysis. Electrolytic reduced water obtained at a cathode electrode side has been found to suppress metastasis of cancer cells. The water had no effects on growth of healthy cells during a one-week test. Not sure what this is supposed to prove. It is rather remarkable reading the patent description for an ordinary electrolysis apparatus which has been understood and used since the 1800s. There is no peer reviewed science provided to justify any cancer-fighting claims. Here, we report that ERW/Pt can prevent transformation of Balb/c 3T3 cells. ERW was prepared by electrolysis of 0.002 M NaOH solution using a batch-type electrolysis device (Type TI-200S, Nihon Trim Co., Osaka, Japan). BALB/c 3T3 cells were treated with 3-methyl cholantrene (MCA) as an initiation compound, followed by the treatment with phorbol-12-myristate-13-acetate (PMA) as a promotion compound. Transformation focus was strongly suppressed by co-treatment of MCA/PMA and ERW/Pt. ERW/Pt suppressed the transformation at the stage of promoter but not at the stage of initiation, suggesting that it suppressed the augmentation of intracellular ROS by PMA. As mentioned above, this is an unpublished, in vitro study that does not demonstrate anything about how alkaline water might treat cancer in the body. Abstract: Certain minerals can produce alkaline reduced water with high pH and low oxidation-reduction potential (ORP) when dissolved in water. Alkaline reduced water (ARW) showed significant anticancer effect. When B16 melanoma cells were inoculated subcutaneously and intra-peritoneally, C56BL/6 mice fed with ARW showed tumor growth delay and the survival span was significantly lengthened. ARW also showed the inhibition of metastasis by reducing the numbers of B16 melanoma colonies when injected through tail vein. The amount of reactive oxygen species (ROS) was very reduced when fed with ARW except for spleen, which is a major organ for immunity. Even for normal mice, ARW intake invoked systemic cytokines, such as, Th1 (IFN-g, IL-12) and Th2 (IL-4, IL-5), suggesting strong immuno-modulation effect. Both ROS scavenging effect and immuno-modulation effect might be responsible for anticancer effect of alkaline reduced water. Apparently an unpublished, unreviewed paper that has the same limitations of other in vitro studies as described above. Scientific Studies that demonstrate negative health effects of drinking alkaline water: To be fair - all these articles are by one research group, and I have not found any other articles to support these claims. It is a good example, however, that if you "cherry pick" your papers, you can support nearly any position you choose. Title: Degradation of myocardiac myosin and creatine kinase in rats given alkaline ionized water. Title: Histopathological influence of alkaline ionized water on myocardial muscle of mother rats. Title: Influence of alkaline ionized water on rat erythrocyte hexokinase activity and myocardium. Title: Effect of alkaline ionized water on reproduction in gestational and lactational rats. Abstract: Alkaline ionized water (AKW) produced by electrolysis was given to gestational and lactational rats, and its effect on dams, growth of fetuses and offsprings were investigated. The results showed that the intake of food and water in dams increased significantly when AKW was given from the latter half of the gestation period and from the former half of the lactation period. Body weight of the offsprings in the test group, both males and females, increased significantly from the latter half of the lactation period. During the lactation period and after weaning, the offsprings in the test group showed significantly hastened appearance of abdominal hair, eruption of upper incisors, opening of eyelids and other postnatal morphological developments both in males and females, as well as earlier separation of auricle and descent of testes in males compared with the control was noted. As mentioned above, it was suggested from the observations conducted that the AKW has substantial biological effects on postnatal growth, since intake of food and water and body weight of the offsprings increased and postnatal morphological development was also accelerated. Copyright © 2005 Randy Johnson. All rights reserved.